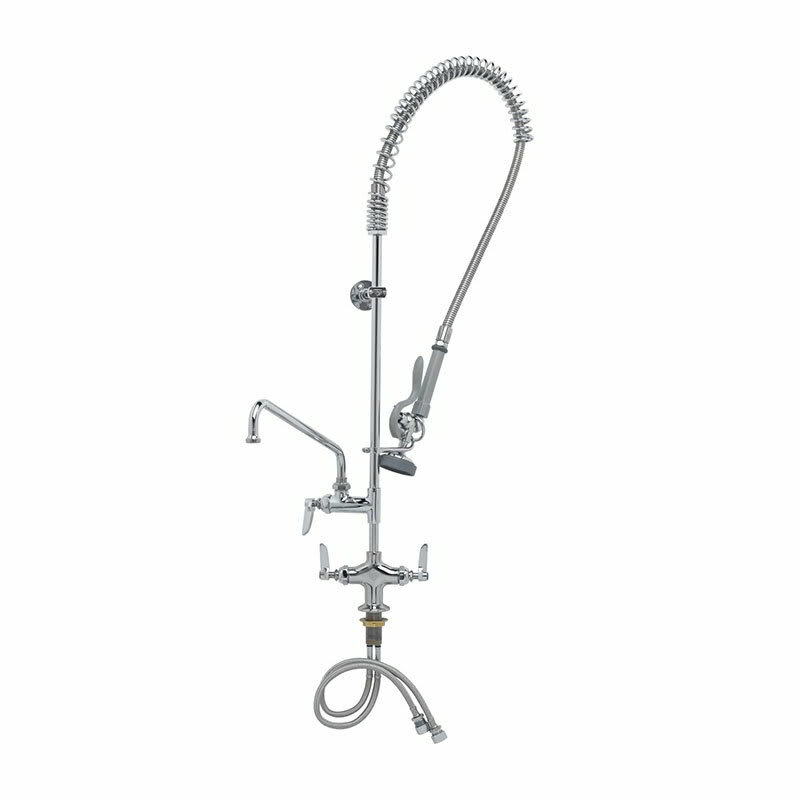 The T&S Brass B-2338 pre-rinse unit is deck-mounted and includes a spray valve and faucet. Water crossflow is prevented with the use of Eterna cartridges, which use spring checks as an added safety measure. The handles and spray valve are made of chrome-coated brass. The lever handles are color-coded red for hot water and blue for cold water, and the 12-inch swing nozzle has a Series 1 stream regulator. This pre-rinse unit's rigid riser is 18 inches tall and is secured to the wall with an adjustable bracket. Connected to this riser is a 44-inch-long stainless steel hose. The handle and lever are made of heat-resistant plastic, and the hold-down ring helps make the unit easier to use. A finger hook on the rigid riser helps keep the hose of the pre-rinse unit out of the way when not in use. 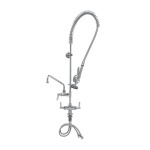 The T&S Brass B-2338 pre-rinse unit is a single-hole mixing faucet with a polished chrome plated brass body.